Asetti is an acclaimed, international architectural and design company, providing exclusive, premium luxury design. They are respected for designing some of the most fabulous homes in the world and have a unique approach and ethos. They provide exclusive clients with the very best in world class luxury and architectural refinement. Images by Asetti. Photographs by David Swann. The world’s leading international luxury home designers ‘Asetti’ launch new super home designs and movie-style celebrity houses to match the super yacht. Eden by Asetti – Inspired by a tropical paradise location and the fabulous home seen in the 1960’s TV show, Thunderbirds. If you like the spectacular homes in the James Bond movies, dream of Tony Starks amazing ‘Iron man’ house, or simply want to live in a breathtaking, unique luxury home, then Asetti is that brand. This international team of eclectic architects and first class designers, turn architecture into art and give clients, ideal movie style homes, unsurpassed anywhere in the world. They think out of the box, bring new meaning to the word ‘wow’ and have developed a luxury name on a par with any super yacht designer. It could be a minimalist house in England, a fabulous tropical villa in the West Indies, or a modern luxury super home in California. If you seek the best, then Asetti are the designers to provide it. Founded by international luxury designer Chris Clayton, Asetti recently took on a new partner and senior architect in the way of legend, Arthur Dyson. One of the only architects to have been under the tutelage of legendary American architect Frank Lloyd Wright, gaining further recognition with 200 architectural awards including the American Institute of Architects (AIA), Presidential Award (2006) and The Lifetime Achievement Award (2014). With Arthur’s unsurpassed experience and Chris’s exceptional creative abilities, Asetti are the perfect dream team. Chris first gained acclaim and notoriety when he showcased his James Bond style super home called ‘Utopia’. It was first seen when it graced the pages in a special edition of London’s premier luxury lifestyle magazine, ‘Dolce vita Diamond’, to coincide with the premier of the of Bond movie ‘Spectre’. This unique pair forms the core of the genius that is Asetti. They share a common goal and that is to create stylish homes of worldwide significance, genuine beauty and timeless luxury. To bestow upon the client a unique work of art and a beautiful home, they love to live in; a luxury home that was created with loving care and dedication to perfection. The clients see it, they feel it and they know it. It is an Asetti design and a design that only Asetti can create. This is the ethos of Asetti. I was lucky to gain access to some of their spectacular portfolio of designs. Some of which are in conceptual stages and including Arthur’s amazing Hilton Residence built in Florida. Arthur’s amazing Hilton Residence built in Florida. Recent super house designs include the amazing ‘Atlantis’. An incredible 5,000 sqm (53,819.55 sq.ft) luxury super home. Briana James in the premier luxury lifestyle magazine Dolce Vita Diamond, called it ‘the most beautiful house design in the world today’. It comes with 10 Presidential suites, a boat dock under the home and a whole myriad of luxury features. Simply overflows with the ‘wow’ factor. It has an uncanny resemblance to the Channel logo, which was not the intention or the inspiration. In fact the root of the idea came from many weeks of research into ancient symbolism and in particular the triple spiral or triskele. It is one of the main symbols seen in Celtic culture, dating back as far as 750 BC, often standing for the “three realms” – Land, Sea and Sky. It’s meaning varies according to interpretation and its source but includes: Spirit, Mind, Body; Mother, Father, Child; Past, Present, Future; Power, Intellect and Love. ‘Luna’ is one of their most recent and available as a design for the discerning client looking for that extra something special. Originally conceived, as a hill top home overlooking Los Angeles. Striking, modern and extremely cool this home is the ideal pad for those who seek a fashionable lifestyle and a fabulous place to call home. Originally conceived as a hill top home overlooking Los Angeles. Striking, modern and extremely cool this home is the ideal pad for those who seek a fashionable lifestyle and a fabulous place to call home. 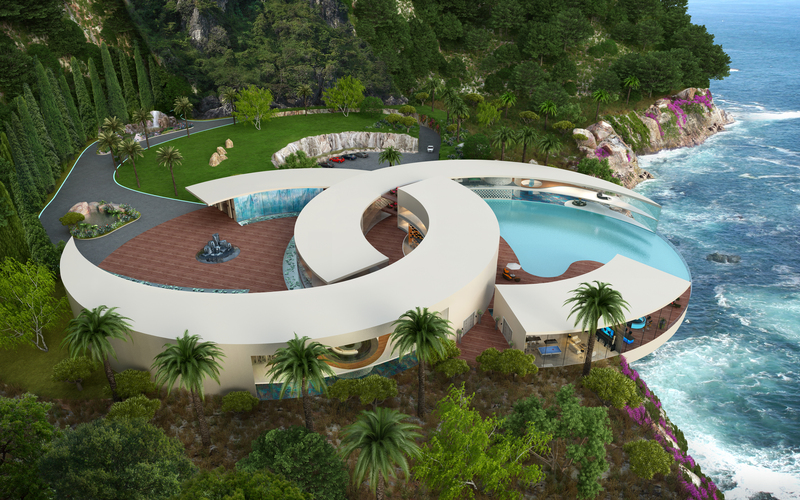 Utopia by Asetti – The James Bond House, as it has fondly referred to by many. Utopia has to be the king of the super homes. Little did Chris know, when creating this incredible home, that he was inventing something missing in the real estate market, the super home. Utopia covers 15,000 square metres of pure luxury and indulgence. It was designed with a private island location in mind, with helipad, tropical lagoon swimming pools, glass pyramid housing a tropical garden and water space, dome, sky bars, glass elevators and automated smart home systems. Including renewable energy sources such as solar systems, and wind power. Architecture into Art. What makes Asetti’s designs so fascinating is the depth to which they research and craft the end result. The passion and imagination that goes into each one is mind blowing. You are not only getting a unique architectural design, but one that pushes the levels to whole new artistic heights. They literally have in many cases, taken home design, turned the industry on its head and creating whole new way to look at the way you can live. In doing so, they have turned architecture into art. This stunning modern super home was spawned from an idea of taking the perfect form of a sting ray and developing it into a house. Covering thousands of square metres, this is the ideal home for a music producer or music lover. Recording studio, music room with stage, spiral stair case, wall aquariums, bar and DJ dance room, elevator, bowling alley and helipad are just come of its exciting features.